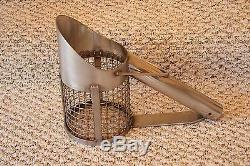 Wood handle Stainless Steel Sand Scoop THIS SCOOP DOES NOT INCLUDE THE HANDLE. 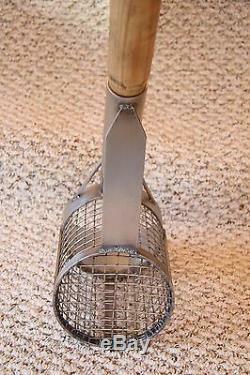 Our sand scoop is made entirely out of stainless steel. The Duck Bill mouth is 14 gauge stainless steel. The basket is made of 16 gauge 1/2 welded wire mesh. Wire mesh baskets sifts sand super fast. The basket has a 1/8reinforcing ring on bottom of scoop. 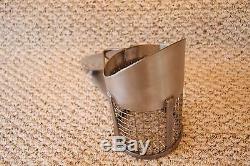 The basket has 1/8" X 1/2"inch wide reinforcing plate welded on the front of the scoop. The sides on the basket have 1/8 " x 1/2" wide plates for extra strength. Reinforced bracket on handle for extra strength. There is a reinforced 1/8 foot plate on the back of the scoop to allow you to push the scoop into the sand with your foot. The handle is made of 14 gauge 13/8 diameter stainless steel and is extremly strong. 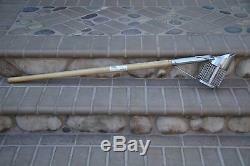 NOT included is a shovel handle that with a little sanding will slide into the handle on the scoop. We drilled a 1/4 hole into the handle so you can drill your wood handle and secure it with a stainless steel bolt. 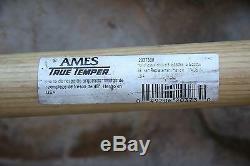 We used a Home Depot shovel handle made by ammes. Your handle may vary in size and require more sanding or cutting to make it fit securIly into the handle. The scoop can be used as a hand held or long handle sand scoop. This break down design makes this scoop a great travel scoop and also makes this scoop over seas shippable. 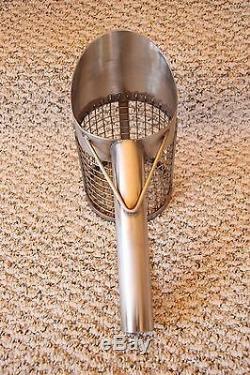 This is a very heavy duty sand scoop designed for use in dry or wet sand. We manufacture this scoop in the USA. Scoop weighs a little over 3 lbs We can modify this scoop to suit your needs. We can make it stronger or lighter. We can add more Stainless to the scoop or take away stainless to make it lighter. We can make it anyway you would like it. Note this scoop is available with a one piece 40 handle that can be made out of 16 gauge or 14 gauge stainless steel. The item "Stainless Steel Sand Scoop for wood shovel handle" is in sale since Tuesday, October 18, 2016. This item is in the category "Business & Industrial\Test, Measurement & Inspection\Test Meters & Detectors\Metal Detector Accessories". The seller is "borderlineengineering" and is located in Burbank, California. This item can be shipped to North, South, or Latin America, all countries in Europe, all countries in continental Asia, Australia, South africa, New Zealand, Reunion.